The last few days spring teased my city with it’s arrival. We had sweater weather with the smell of rain in the air. It was heavenly! Then we woke up to it snowing yesterday morning and it hasn’t stopped since. 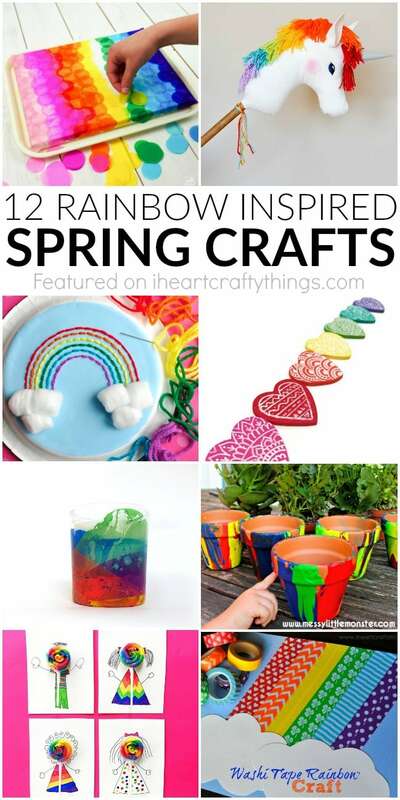 Needless to say, I could use a little extra sunshine and rainbows in my life this week so today I’m sharing 12 rainbow spring crafts that will most surely put a huge smile on your face. We have a fabulous mixture of crafts, sewing, gardening and play so you’re sure to find plenty of inspiration to keep you busy while you’re waiting for spring just like me. 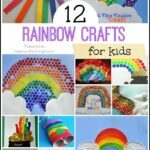 All of the images of the rainbow crafts I am sharing below have been shared with the permissions from the respective bloggers for the purpose of this post. Click on the title links underneath the photo collages to be taken to the full craft tutorials. If you would like to share this post (please do!) we would appreciate if you would use the top square image or the bottom vertical image for pinning. 1. Could this bleeding tissue paper rainbow canvas art be any more gorgeous?! It makes a fabulous piece of art to hang on the wall during the spring months. 2. Get crafty all while brightening someone’s day by making these adorable handmade rainbow candy lollipop cards! 3. 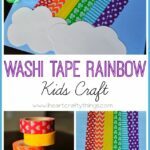 Whether your kids are experienced with sewing or are beginners, they will love creating this paper plate rainbow yarn art. It is another project that can proudly be displayed in the home. 4. 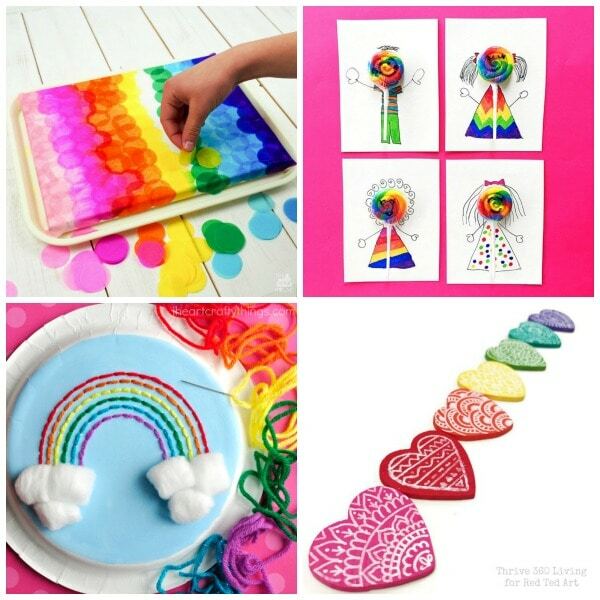 These rainbow heart magnets not only make a perfect rainy day craft but they are fabulous for hanging up all of your child’s spring artwork. 5. Play time can’t get any more exciting with the addition of this easy DIY Rainbow Unicorn Hobby Horse. Find a free pattern on the site to help you make one for your children. 6. These DIY Rainbow Candles are super fun to make and they add a lovely rainbow touch to your home decor. 7. Kids will have a blast coloring and weaving together these fun rainbow danish hearts. A printable is included making the craft super easy to throw together in no time at all. 8. Get ready for spring planting by making these pretty pour painting flower pots. 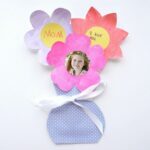 I’m thinking a little ahead but these would make a fantastic gift for mom’s and grandparents for Mother’s Day! 9. 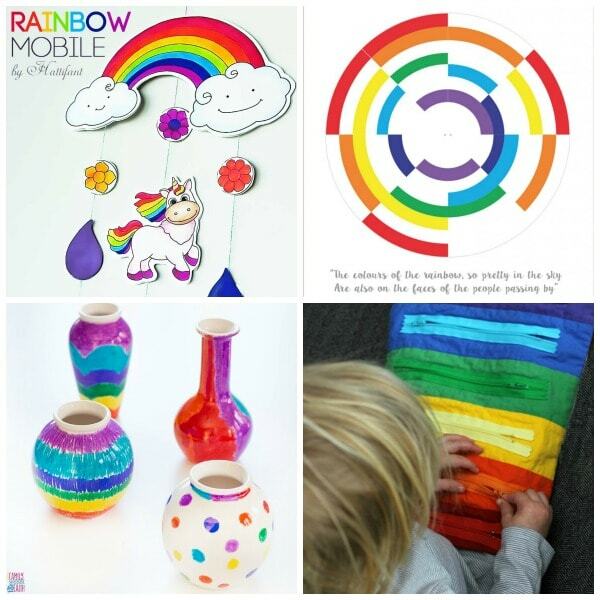 After making this cute rainbow mobile kids can cheerfully hang it up in their room to bring them a smile every time they are there. Such an adorable spring craft! 10. Print off this rainbow color wheel printable and make it into a spinner for hours of rainbow fun for kids! Make sure to head over and watch the video clip of these awesome rainbow spinners in action! 11. 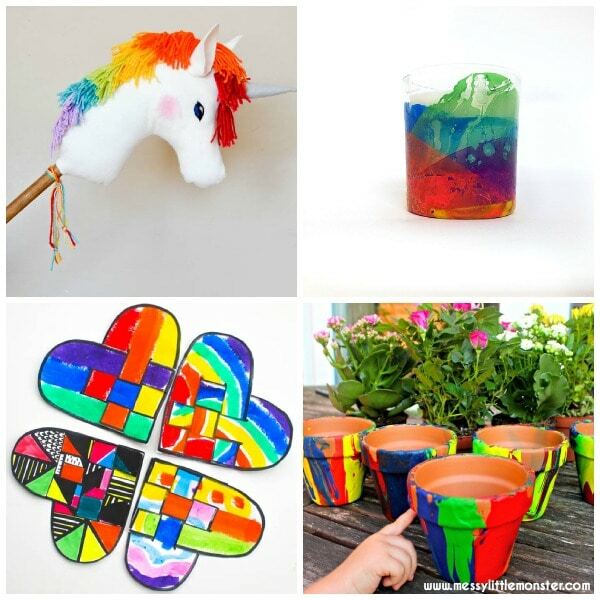 These DIY rainbow vases are another fun craft for kids (and adults) to add some fun spring colors into your home. 12. Make a fun zipper rainbow toy for your little ones not only for play but also to work on fine motor skills and to help them learn all of their colors. 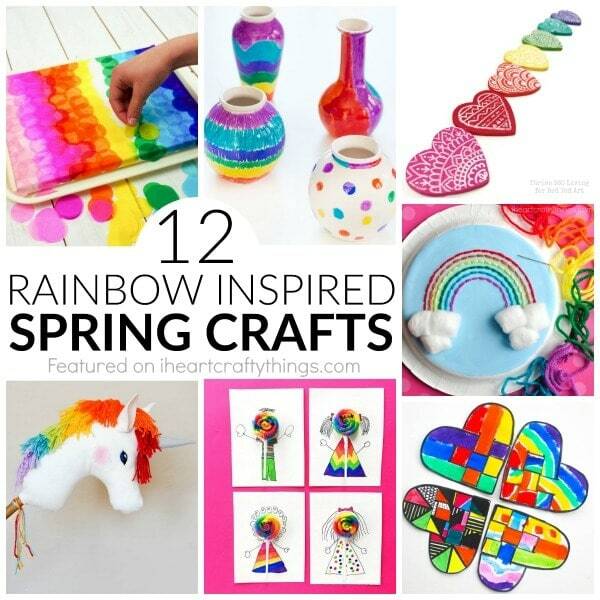 Did you love these gorgeous rainbow spring crafts?